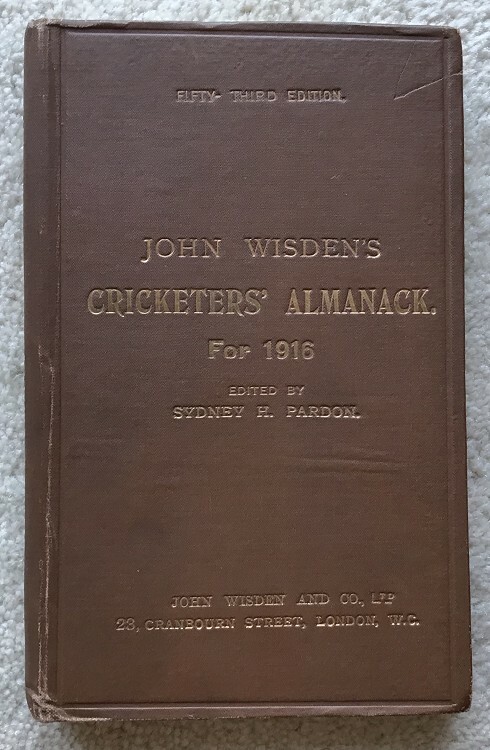 Here we have a rare 1916 Original Hardback Wisden, in Very Good Condition. The 21st Wisden Hardback and the most expensive of the 20th Century. The rarest or second rarest since 1900. I have been agornising over which of two 1916s to keep as they are both in such amazing condition but to sum up this Wisden is as nice as the one I own in my master set. The lettering is always an issue (if you like shiny gold leaf) on 1916s , i guess they were rationed on the gold leaf in 1916, however the front board has very good gilt for a 1916. The spine is faded and no dot after the year which is correct. Small name to first page corner. The boards are very good , small line mark to the corner at the top of the front board but other than that , nice clean boards. Inside the hinges are very good, both are springy! Amazingly clean inside including the yellow pastedowns. Minimal foxing.